The success of the project was celebrated at the China Wind Power 2017 event in Beijing (17-19 October). However, the first blade was produced by LM Wind Power in September. 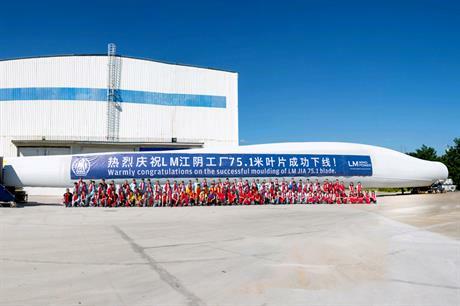 LM claims it is the longest blade to be produced in China to date. The blade will be used on Goldwind's latest offshore offering, designed for "wind class one" areas off the Fujian and Guangdong coast, east China, LM said. The new blade follows LM previously supplying Goldwind's 3MW prototype turbine with 66.9-metre blades in January. LM Wind Power announced plans to open a new factory in north-east China's Baodi district in May. LM first set up a manufacturing base in China in 2001, and now employs 2,500 people in the country. It has three further blade-making facilities in Tianjin, Qin Huang Dao and Jiangyin, with offices in Beijing and Shanghai. The Danish blade manufacturer has also supplied blades to China Shipbuilding Industry Corporation HZ Windpower (CSIC-HZ) for its 5MW offshore turbine.